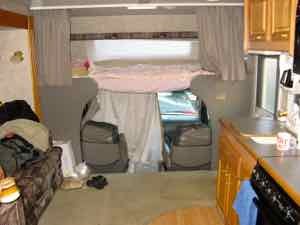 The best way to find out if you'd like traveling in a motor home is to rent an RV for a trip. What ever size it is. See if you can live with dumping the gray and black water. Get the water and power hooked up? You can rent an RV easily in the U.S.
You can also rent "caravans" in Australia and Europe... but mainly, I'll talk about the U. S. market here. Some are national and some are local to the area you might be visiting. 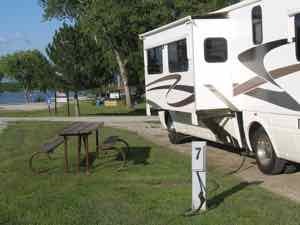 Some companies also are brokers who will help private RV owners rent out their RVs when they are not in use. Will That RV Come Equipped or Bare? There are some things to think about if you rent an RV... and the first is that you might have to equip it. There will be different contracts and rules in each situation. Privately owned RVs may come with linens and dishes. RVs rented from fleets of rentals will probably come "bare". There won't be bedding or towels. No cleaning supplies for dishes... no toilet paper. Some rental agencies offer packages for bedding and kitchen ware. Others don't, so you'll need to choose the agency that can best help you with what you need. If you rent an RV from a place in your hometown... you'll be able to equip it yourself from your own home. If you're a foreign visitor renting an RV or if you're renting an RV in a different state... you'll need to buy supplies or rent them from an agent. 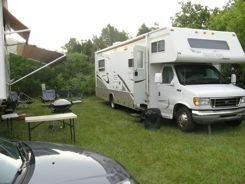 Rental RVs have been used. They will be fairly clean, but don't be surprised if they may look a little worn. Try to have the rental agent brief you in how to use the appliances. Does the propane tank need to be turned on when you park and off when you're on the road? Do you need jacks to stabilize it when you park? Where are the electrical and water hookups stored? How do you check on "gray water" and "black water" to see if they need dumping? How Much Room Do You Really Have? Most RVs are great for two, but some can accommodate 4, 6 or 8. And the less privacy you will have. You'll have to stow things away during the day if you want sitting room. There is storage space for groceries and some closet space, but it is limited. Once you get organized, the refrigerator will hold more than you think, and you'll get into a routine on how to use the space you have. We've talked to friends who just love traveling with their own RV, but they all rented an RV first to see if they liked traveling that way. We thought it was an interesting experience, and we'd probably do it again in the right circumstances. We're just glad we had those friends to tell us what to expect when we rented that RV.